We started raising silkies in 2009 and have just thoroughly enjoyed learning more about these sweet birds every day. In 2010, we started showing them at some of the poultry shows. Please check out our Show Results page to see which shows we've attended in 2010/2011. We especially have enjoyed meeting so many wonderful silkie breeders that love to talk about silkies as much as we do. We currently raise exhibition quality black, splash, blue, white, lavender, blue cream (porcelain), ginger red, buff and paint silkies. 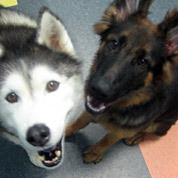 The flock is named after our most beloved red Siberian Husky who past away in January, 2009. He's the MOST AWESOME red husky that ever lived. We were very fortunate to receive the opportunity to partner with Alan Stanford from browneggblueegg when we first started out and have his birds as apart of our foundation flock. Our silkies have a wonderful home where they are cared for as a member of the family. They even have a body guard to help protect them (a german shepherd). We are certified pullorum-typhoid testers for the state of Virginia and a member of the American Silkie Bantam Club, the American Bantam Association and NPIP member (#52-228). We do not have any birds available for sale at the moment but hope to have some later in the spring. We do not sell eggs.